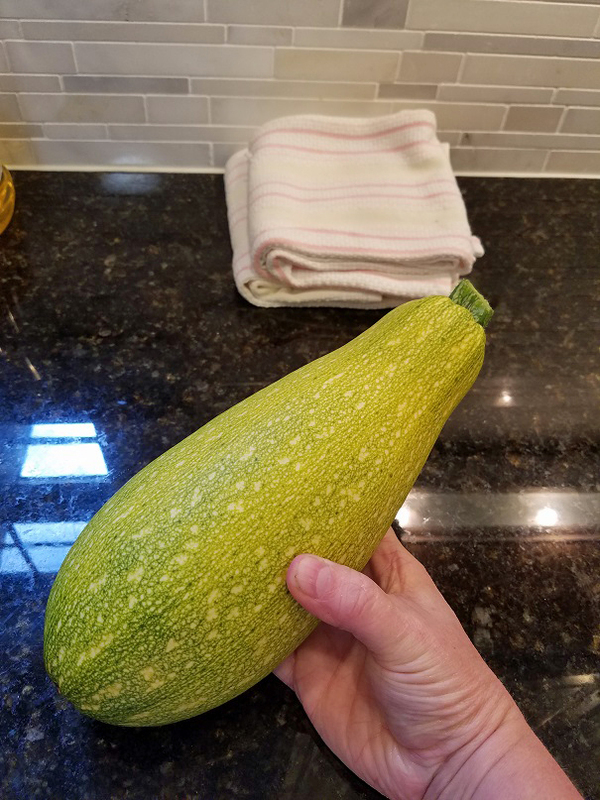 Monster zuke...coming to a garden near you! 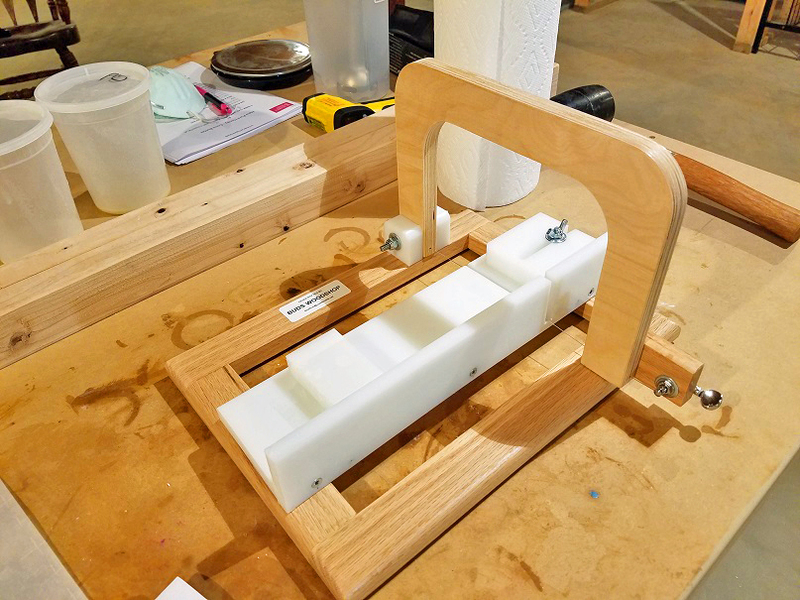 Second, I am so excited to have received my first, official soap cutter from Bud's Woodshop on Etsy. This handcrafted work of art has GREATLY replaced the embarrassing cheese slicer I was using to cut loaves of soap, LOL! 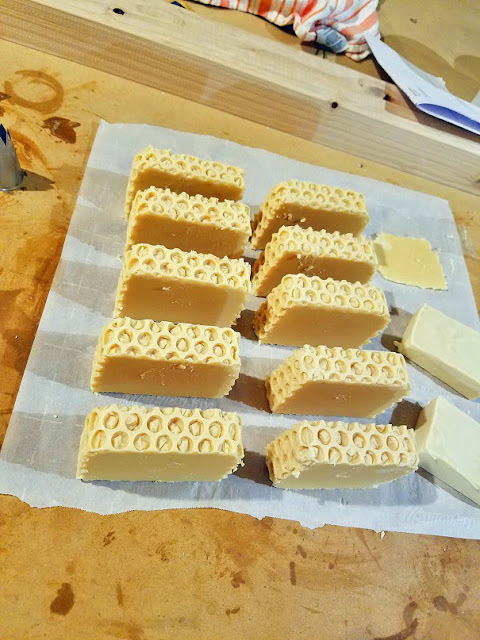 Third, I reworked my Honey Soap recipe....AGAIN. The last batch I made where I discounted the water amount and included pink sea salt to get a harder bar did not turn out the way I had hoped. It still did not have that smooth, creamy, hard bar look I was aiming for. In fact, this and many of my past batches came out with a sort of grainy look to them and I suspected the large amount of sunflower oil was the culprit. It's still amazingly luxurious to use, but not what I want my final product to look like. So, I tried another batch and replaced half of that sunflower oil with cocoa butter. 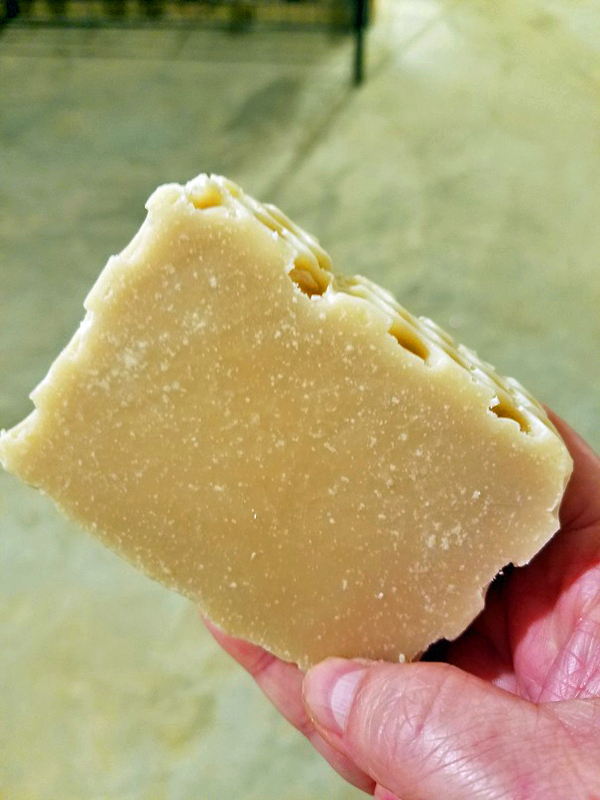 Cocoa butter contributes to a harder bar of soap, while also contributing to its moisturizing benefits without decreasing lather, unlike shea butter. It also helps with eliminating soda ash. I immediately liked how this loaf looked compared to my other batches. 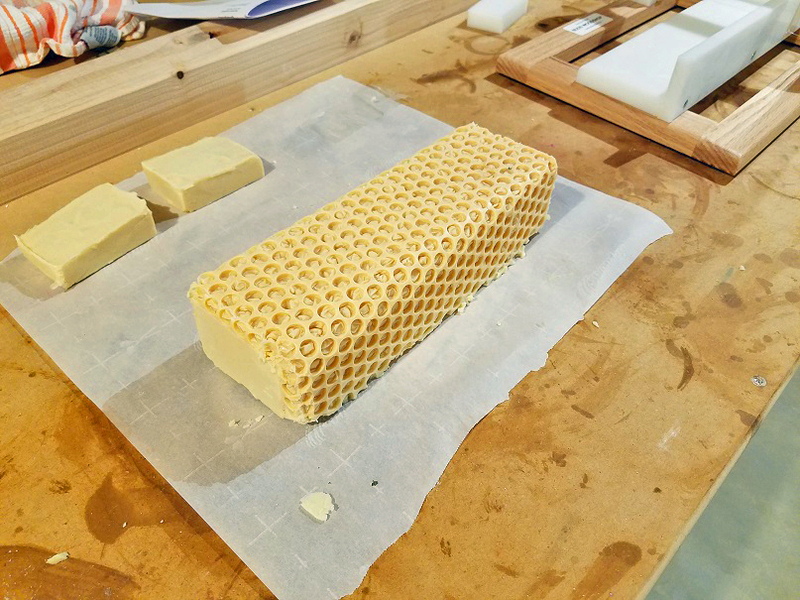 It had a nice, consistent creamy-smooth appearance and I was able to unmold it and cut at 24-hours. Usually, I have to wait 48-hours with my previous, more sunflower oil, batches. My new soap cutter is a dream! No more uneven bars of soap. So, we will see in 4-6 weeks how this turned out, but I have a feeling I'm on to something! Beautiful Honey soap. I'm still a fan of the high sunflower oil content for the health benefits for my skin. I love the honeycomb pattern you use. Definitely has eye appeal which is important for sales. Humans buy with their eyes and not their brain - especially US citizens. Thank you Mary! 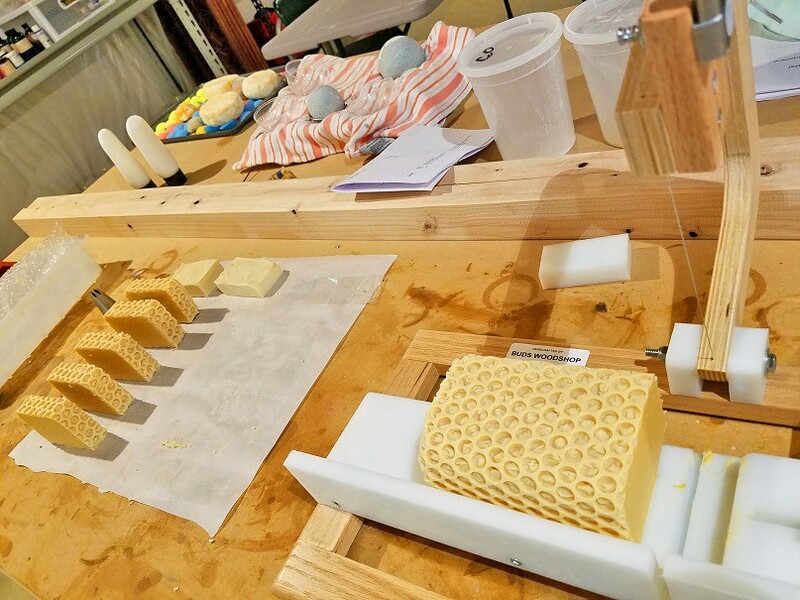 I love the sunflower oil too, but it makes my soap too unstable, but I will find a way to still make it special. Trial and error.